A viral arrest video is sparking some debate on social media. 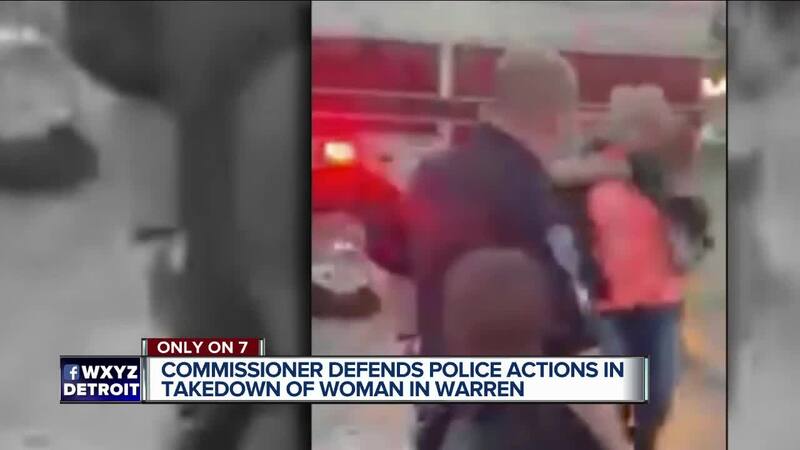 The footage shows a woman being taken down by Warren police officers, after reportedly refusing to disperse. Commissioner Bill Dwyer is standing by the officers involved. "They’re doing their jobs," Dwyer told 7 Action News. WARREN, Mich (WXYZ-TV) — A viral arrest video is sparking some debate on social media. The footage shows a woman being taken down by Warren police officers, after reportedly refusing to disperse. Commissioner Bill Dwyer is standing by the officers involved. "They’re doing their jobs," Dwyer told 7 Action News. The incident occurred Monday evening on Ford Avenue just off 9 Mile Road in a residential neighborhood. Officers were first called there for reports of shots fired by teenagers. Shortly after that first call they returned, when Dwyer said a “mini riot” started. A fight broke out, leaving several people injured. The woman shown in the video has been identified as Nancy Hooks. She was asked to disperse multiple times by police officers according to Dwyer. However, she reportedly refused. "She was a person the officers are trying to calm down. They’re trying to make a peaceful situation out of a chaotic mini-riot," Dwyer said. “We look at how many times she was warned to back off, she refused. She came forward at the officers kind of started pushing. He kind of pushed back, she tripped over, she was taken to the ground, she was picked up." Hooks was arrested for Hindering and Failure to Move on. She was released on $10,000 cash bond. According to Warren Police, Hooks has not filed an excessive force complaint against the department at this time. Six people were arrested following Monday’s fight — including one minor. The Warren Police Department does not currently use body cameras. Dwyer said if funding is secured, body cameras will be used in the near future.